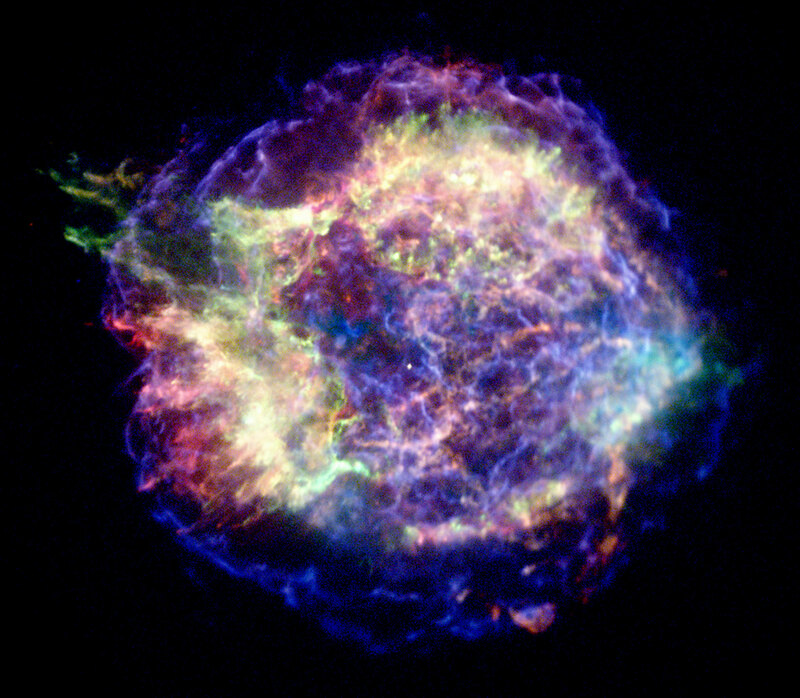 This Chandra X-ray photograph shows Cassiopeia A, the youngest supernova remnant in the Milky Way. NASA/CXC/MIT/UMass Amherst/M.D.Stage et al. The study winds back time on massive black holes by analyzing their visible precursors—supernovae with collapsing cores. The slow decay of these massive stars creates bright signatures in the electromagnetic spectrum before stellar evolution ends in black holes. Using data from the Lick Observatory Supernova Search, a survey of nearby galaxies, the team compared the supernovae rate in outer spiral galaxies with that of known hosts—dwarf/satellite galaxies—and found comparable numbers for typical spiral outskirts and typical dwarf galaxies, roughly two core-collapse supernovae per millennium. The study, “Supernova Rate beyond the Optical Radius,” will appear in an upcoming issue of Astrophysical Journal Letters. The study’s findings complement Chakrabarti’s 2017 study, which showed that the outer parts of spiral galaxies could contribute to LIGO detection rates. The regions form stars at a comparable rate to dwarf galaxies and are low in heavy element content, creating a conducive home for massive black holes. The current study isolates potential candidates within these favorable galactic environments. Co-author Brennan Dell, a recent graduate from RIT’s computer science program, analyzed the data with Chakrabarti during his undergraduate co-op. “This work may help us determine which galaxies to be on the lookout for electromagnetic counterparts of massive black holes,” Dell said. NASA and National Science Foundation awards funded Chakrabarti’s study and contributions from co-authors Dell and Benjamin Lewis at RIT’s Center for Computational Relativity and Gravitation; additional co-authors include Or Graur from Harvard-Smithsonian Center for Astrophysics; Alexei Filippenko at University of California, Berkeley, who leads the Lick Observatory Supernova Search; and Christopher McKee at the University of California, Berkeley. 1 Comment on "Further Evidence That Outskirts of Spiral Galaxies Host Massive Black Holes"
Great work. But I feel like there is some terminology issues in this article, among stellar-mass, intermediate-mass, and super-massive black holes.